A new concept race car jointly developed by German chemicals firm BASF and Hyundai Motor, RN30, has moved away from carbon fibre-reinforced polymer (CFRP) to reduce weight, utilising BASF’s Elastolit rigid integral foam and reaction injection molding (RIM) systems developed for body panels. The latter are said to permit challenging designs like the fender and spoiler of the RN30 and allow for painting. The RN30 also features BASF’s Elastoflex E, a spray impregnation PU for light and stiff sandwich structures consisting of a long fibre-reinforced surface layer and a paper honeycomb. Its Infinergy is the world’s first expanded TPU, which combined with an elastic coating is used in the roll bar padding of the RN30 for durability and resilience. As for the braking system, BASF says it developed a breakthrough technology, Hydraulan 406 ESI, which fulfills legislative requirements by extending the durability of the brake elastomer. For electronic assemblies of the RN30, BASF’s new Ultramid Advanced N allows for miniaturisation and functional integration. Other features undertaken by Hyundai include a bucket seat for racing, fitting the driver’s body and an integrated roll cage, which increases the vehicle body strength and protects the driver in precarious situations. For the seat shell and pan, BASF offers Ultracom, a thermoplastic composite system while its near infrared-reflective films, protect windows against solar heat and its waterborne ColorPro IC basecoat “Performance Blue” is used on the exterior with a layer of iGloss clearcoat. Solvay launched Technyl REDx, a new heat performance PA66 integrating a “smart molecule” self-reinforcement technology, said to outperform conventional speciality polymers in demanding thermal management systems. It includes a patented self-strengthening technology present in the polymer chain without affecting its structure. This technology remains inactive during moulding of car parts, leaving the material behaving like a high-flow PA66. During the vehicle’s use, the elevated temperatures activate the smart technology, leading to rapid cross-linking that boosts the mechanical properties far beyond their initial values. Technyl REDx can be processed at temperatures below 100°C. Ageing tests over 3,000 hours at 220°C demonstrate high retention property as well as tensile property gain of more than 50%, without degradation of elongation at break. It is said to help meet growing demand for downsized engines. 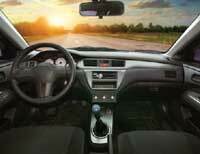 Solvay also launched Technyl 4Earth, a postindustrial PA66 sourced from automotive airbags. Industrialised in Poland, the patented process is able to separate the nylon from the airbag's silicone. It had on display an automotive oil filter made of the material. What’s next for a company that has proven that a solar-powered plane is possible? An electric concept car! Germany-based Covestro’s featured car, developed in collaboration with design students from Sweden and Finland, showcases a wrap-around glazing made of transparent PC, a new lighting concept as well as seamless integration of the PC body with the PC lighting. For the rear of the vehicle, together with lighting and electronics supplier Hella, Covestro developed a solution based on holographic films, where various light functions can be integrated. Said to be an industry first, Hella developed the holograms before Covestro then incorporated these into a transparent holographic film, which retains the design and is laminated onto a 3 mm glass plate. 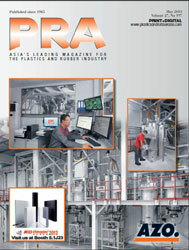 For series applications, plastic will be used instead of glass. The holographic film is illuminated from behind using LED light sources and reflectors, resulting in a 3D effect. Other new developments are the 70%-biomass coating hardener while another hardener enables plastic automotive add-on parts to be coated at low temperatures. Dutch materials company DSM launched its third generation ForTii Ace polyphthalamide (PPA), as a replacement for die-cast metal applications that require a high mechanical performance at temperatures as high as 150°C, and costlier engineering resins like PEEK. The resin has a glass transition temperature of 160°C, said to be higher than other PPAs, and 80°C higher than PA66. 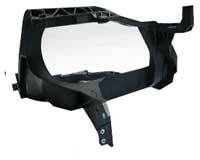 It is targeted at powertrain, transmission, chassis, and thermal management applications. Ineos Styrolution presented its StyLight composites, said to be the first styrenic-based thermoplastic composites available on the market, with stiffness and impact strength properties exceeding PA6 and PC-based composites. Based on a modified SAN, the material is offered with both glass or carbon fibre fabrics for semi-structural applications in automotive interiors including seating modules, lower consoles, instrument clusters and tailgate modules as well as for electronics (eg. back covers of mobile devices), medical industry (eg. prostheses, orthoses) and sports equipment. The company says the material offers a thickness reduction of 50-70%, compared to injection-moulded parts, resulting in a weight reduction of up to 50%. It comes as semi-finished goods or thermoplastic sheets, for processing via thermoforming and over-moulding. Its surface property allows a wide range of decorative solutions from printing over foil lamination and conventional painting. Middle Eastern materials supplier Sabic highlighted the use of its Noryl GTX PPE/PA6 resin in an automotive body-in-white (BIW) reinforcement on Fiat Chrysler Automobiles’s 2015 Jeep Renegade. It reduced the weight by 45%, compared with an all-steel alternative. 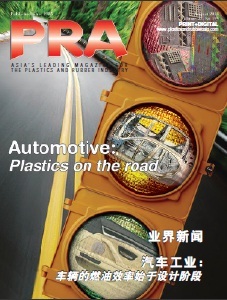 Through use of the resin in a thermoplastic honeycomb design with metal flanges, the automotive maker was also able to meet side impact protection requirements. An example of lighter bumper parts (Škoda Auto’s Fabia model) via thin-wall moulding of a new PP compound was also shown. The result allowed Tier 1 supplier Magna Exteriors to reduce the bumper’s thickness from 3 mm to 2.5 mm and reduce part weight by about 10%. Other new materials like its POM (unfilled polyoxymethylene or polyacetal), and Sabital glass fibre-reinforced polyacetal are targeted at automotive fuel pumps and door handles. US firm Celanese has entered the PEEK market with the launch of its Celapex solution that enables moulding of thin-wall, long-flow parts and facilitates ease of processing even at high filler loading. It is said to maintain many of the physical, mechanical, thermal, and electrical properties of PEEK. Furthermore, it launched a flexible Fortron PPS, which is heat-resistant, to meet the need for smaller engine compartments and complex industrial machinery that have high temperature requirements. The company said its new high-flow Celstran LFT (long fibre thermoplastics) cater to thinner (1-1.5 mm) and lighter parts. Initially offered as PP-based, other polymers can also be used. Targeted applications are front end panels. Elix Polymers’s new ABS/PC blend, Ultra HH 4115 HI, is to meet the trend to replace PC/ABS parts with ABS/PC blends, especially for interior parts. The material’s advantages include 5% lower density with 1.07 g/cm³ versus PC/ABS 1.13 g/cm³, low emission and odour. Its high flowability rate helps to reduce cycle times. The Spanish firm says other benefits include its high impact strength, good processability and paintability. Tests according to ISO6603-2 (puncture impact behaviour) have shown performance of the material at different temperatures for crash-relevant parts such as interior pillars. The appearance of the fracture was evaluated as positive by several premium car manufacturers, such as BMW that has approved it according to GS93016 ABS+PC heat resistance. Another car maker Audi is considering the material for lower instrument panel parts, centre console parts and door panel parts.